Lets face it, the midwest is best. 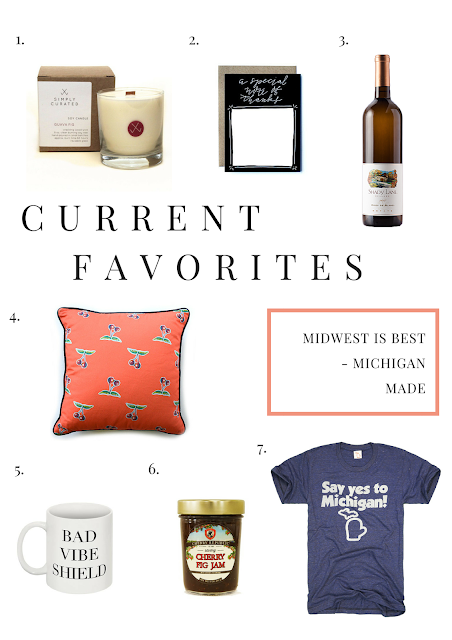 As a Michigan girl born and raised I've rounded up a few of my favorite Michigan made products that I currently love. What are some of your favorites? 1. This guava fig soy candle from Simply Curated smells absolutely amazing. 2. I love the designs from Whimsy and Wild and this thank you card is perfect for a showing your appreciation. 3. Northern Michigan is known for their wine and I'm currently drinking Shady Lane Cellars Coop de Blanc. 4. How adorable is this cherry print pillow from Leland Gal? 5. The best way to enjoy your morning coffee is in this Sweaty Wisdom mug. 6. I'm obsessed with all things Cherry Republic and this cherry fig jam would be a great addition to a cheese plate. 7. Say yes to Michigan with this The Mitten State t-shirt.